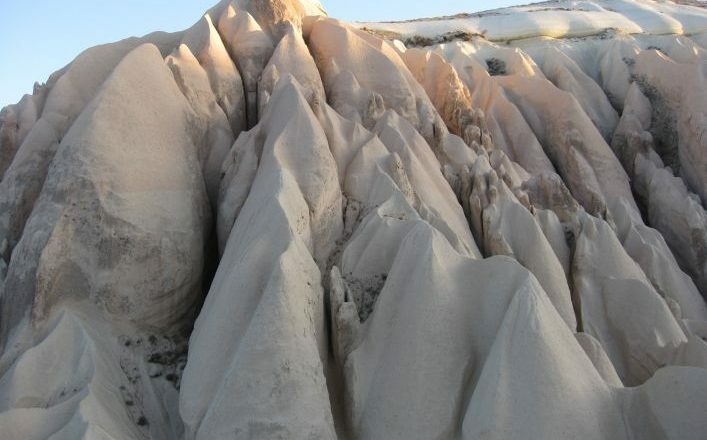 Cappadocia is not only a wonder of nature. Cliff openings give access to cave dwellings, rock-cut churches, monasteries and underground cities created during the earliest Christian era. The violent eruptions of the volcanoes Erciyes and Hasan three million years ago, which covered the surrounding plateau with tuff, lava and volcanic ash, are at the origin of the strangest landscape on Earth. Undergoing erosion by wind and water, this plateau was shredded, creating monumental rock formations. Rock cones, capped pinnacles and fretted ravines are the result, in colours ranging from warm red and gold to cool greens and greys. “Fairy chimneys” with flat stones on the top, and cones with distorted shapes combine to embellish the landscape in a manner almost beyond the imagination of a surrealist sculptor. 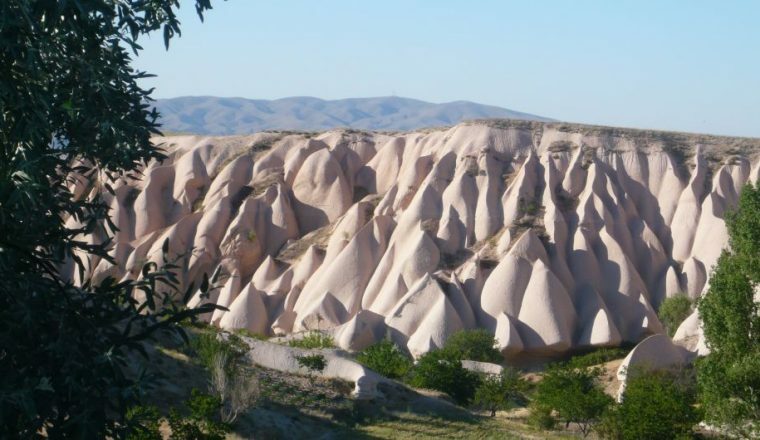 Cappadocia is not only a wonder of nature. Cliff openings give access to cave dwellings, rock-cut churches, monasteries and underground cities created during the earliest Christian era. Accommodation with breakfast and dinner. Entrance fees to Ihlara and Derinkuyu. Not Included: Flights, lunch, tips and personal expenses, drinks, entrance fees not mentioned above, travel insurance and dinner in Kayseri. Departure Dates: This holiday can commence on the day of your choice – April to November. Sometimes it is available later in the season – it depends on the weather so please ask. Visa Information: The Turkish Consulate has advised that the stamp / sticker visa on arrival will be abolished from April 10, 2014 and will be completely replaced by the e-visa application process. All visitors to Turkey are required to purchase their entry visa via the Turkish Government website www.evisa.gov.tr prior to travel. Meet at the airport of Kayseri and transfer to Cappadocia (1 hour).Check into our accommodation for the next four nights in Mustafapasa, a charming town which was inhabited by Orthodox Greeks until 1923. At this date Turkey and Greece signed the Lausanne Treaty, concerning the exchange of population between the two countries. Today, you can still see Greek masonry on the exteriors of old houses. After breakfast we start the walk in Monastery Valley with its wonderful rock formations. Ancient Greek rupestral churches can be seen on the way. 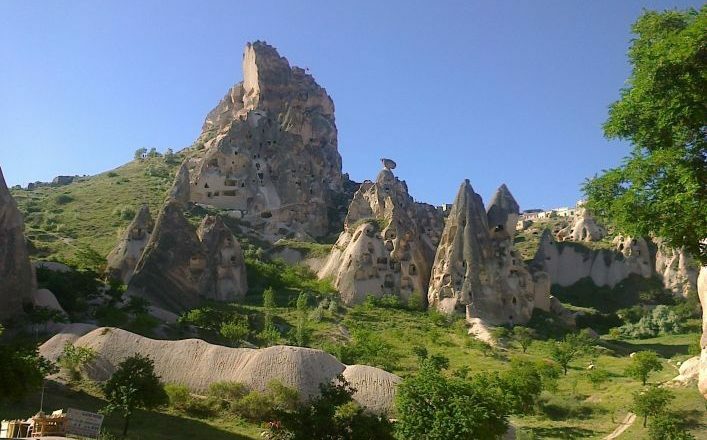 Cross a scenic plateau before descending into Tahtali Valley, one of the most typical in Cappadocia. Then follow a pleasant pathway to return to Mustafapasa village.5 hours walk. After breakfast, you will be driven to the trailhead near the Damsa barrage, which provides water for the village fields. From here you walk along the foot of a natural tumulus carved by erosion and known as Golgoli by local people until you reach a plateau and the village of Ayvalik. Experience the hospitality of the inhabitants, perhaps, with a tea-break in the local café. 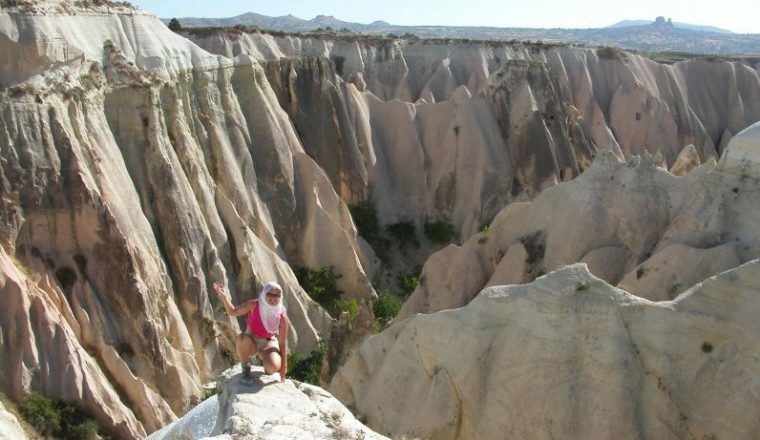 Overnight in Göreme.5 hours walk. The trek starts in Gomede, an old village carved out of the rock. Visit the church of Saint Basile from the 8th century; then continue along Uzengi Valley, bordered with a high cliff of white tuff peppered with pigeon houses. The trail continues into Pancarlik valley, a fantastical landscape of tumbling rock waves in pastel colors, patchworked with vineyards and terraced gardens. 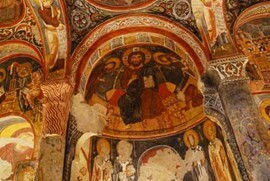 You may like to visit the architecturally interesting churches of Sarica and Kepez. Possibility of ending the walk in Ortahisar village from where a rocky outcrop offers a wonderful panorama. 5/6 hours walk. Ortahisar village is the starting point of the walk. Enter the Balkanderesi valley, with its unsual rock formations, ending at Ibrahimpasa, an old Greek village known as Babayan – here again you will recognise the ancient Greek style of architecture. In the afternoon discover the beauty of Zindanonu Valley, before returning to Goreme for overnight. 5/6 hours walk. 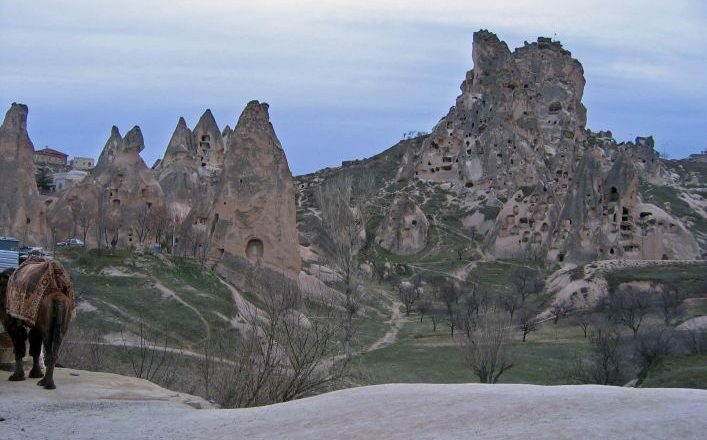 Walk to Paþabag Valley (also called Priest Valley), along a cliff dominating the most famous fairy chimneys of Cappadocia. Pass through Cavusin village, one of the first Christian settlements, visiting the old church dedicated to St. John the Baptist, where you can still recognise the fresco of Salome dancing for Herod. 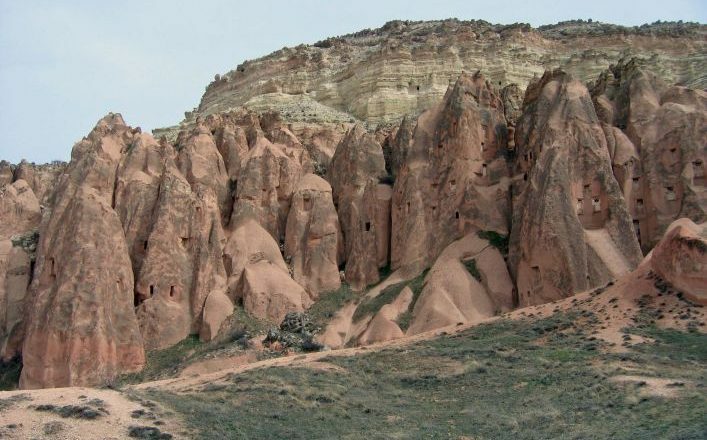 Afterwards, continue to Kizilçukur (Red Valley), possibly the most beautiful valley in Cappadocia, with its magical rock formations and brilliant red colours, the result of rain and wind working together millions of years ago, to erode the soft volcanic rock. Small valleys, cones, peaks and fairy chimneys alternate along the route. Here, man used the landscape to build cave-dwellings, and frescoed churches, which can be visited en-route. Night in Goreme. 6 hours walk. The trailhead is at the beginning of the Akvadi (white valley). Walk in this valley following an old river (now dried up), with fruit gardens and vineyards and fairy chimneys that are particularly slender and precarious. 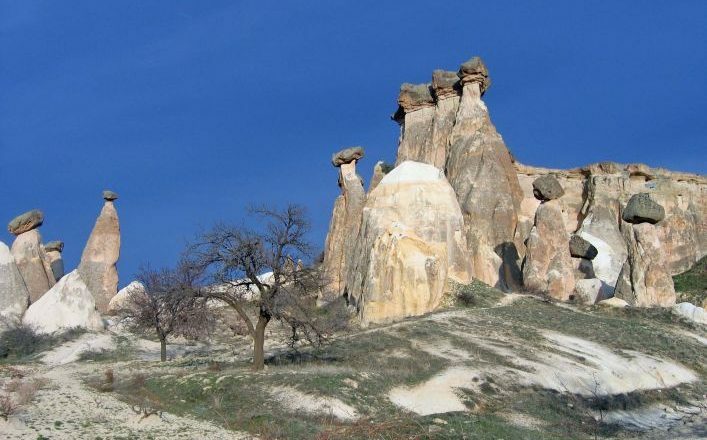 At noon, arrive in Uçhisar village to visit the high viewpoint known as “fortress” (a volcanic ash peak). In the afternoon, walk in the pigeon valley, called so because of the numerous “pigeonhouses” built in the 18th century. Arrive Goreme for overnight. 5 hours walk. Day 8: Cappadocia – Kayseri.Transfer to Kayseri airport.